Gafoors yesterday began redeploying hundreds of workers who were affected by the fire that devastated the company’s Houston Complex on Monday, leaving billions of damage in its wake. 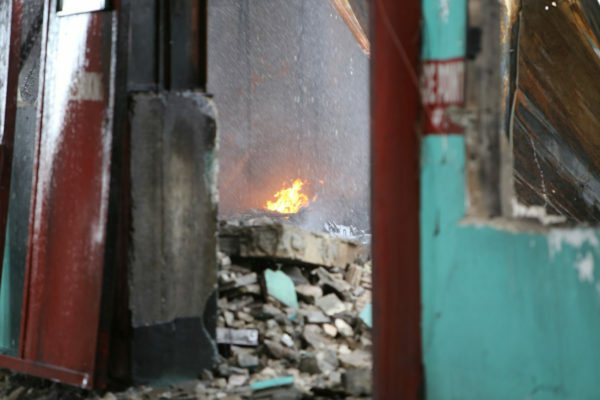 Up to yesterday, the cause of the fire, which was said to have started in a bond located in the western section of the compound before quickly spreading to other sections, remained unknown. As a result, however, close to 60% of the complex was destroyed, leaving more than 500 employees displaced. Scores of employees turned up at the Houston location yesterday morning for a meeting that was held by the major hardware company on their employment status. Executive Chairman of the company Sattaur Gafoor later said that the meeting was held to apprise the employees of what took place on Monday and to discuss their redeployment to the company’s other four branches, located at Nismes, Parika, Land of Canaan and Beterverwagting. Gafoor further disclosed that those who could not be absorbed by the other branches will be occupying the front of the Houston building that was left untouched by the fire. 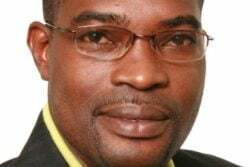 He explained that they hope to be up and running in the next few days, with the installation of air conditioning units as well as electricity and phone lines. In the meantime, he explained, the workers who are directly affected and cannot work will be paid 50% of their salaries, while others will remain on location and work in their departments that have not been destroyed by the fire. Gafoor was unable to estimate the damage suffered but he noted that in terms of the building and the stocks that were destroyed, the cost could possibly amount to billions of dollars. Nevertheless, he remained hopeful that once they are cleared by the insurance company, repairs to the building would begin immediately. “Within two months’ time, everybody would be back,” he said. 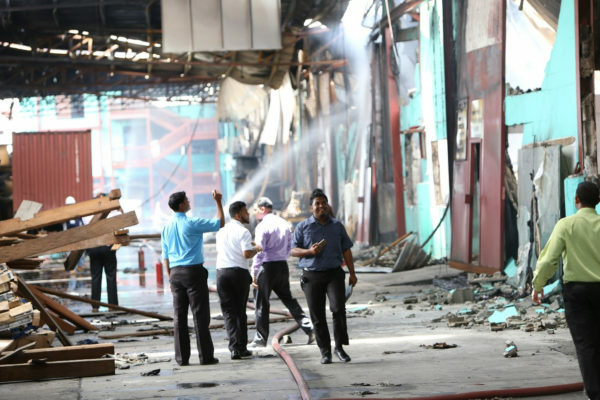 While employees were still traumatised after witnessing the fire consume their place of employment, several of them praised Gafoor for looking out for their best interests even as he was left to pick up the charred remnants. Two such employees were Radha Singh and Vanessa Henry, store operators who have been employed with Gafoors for a combined total of 21 years. 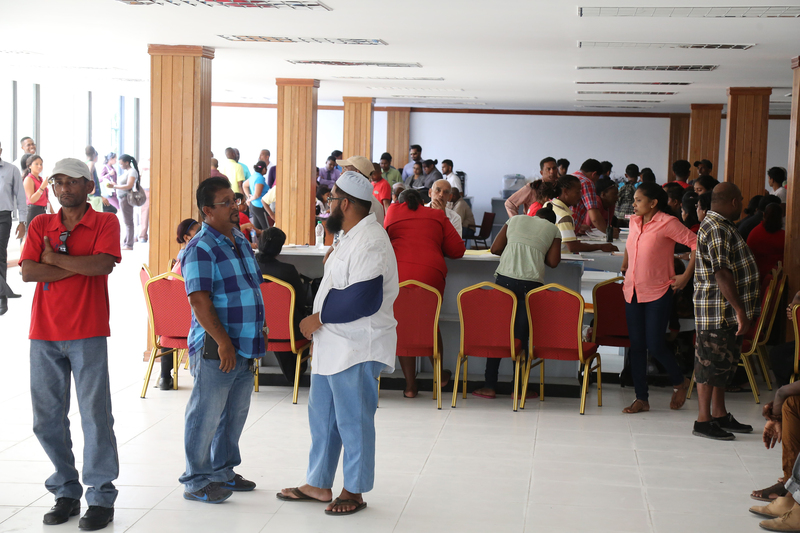 When Stabroek News approached the women, they were recording contact information for other employees. Asked to recount what happened on Monday, both women explained that when the guards first raised an alarm, they thought the complex was being attacked by bandits. “Everything happened in jiffy. When the guards came inside, they started screaming, ‘Everybody outside! Everybody outside!’ And we just run out,” Singh explained. 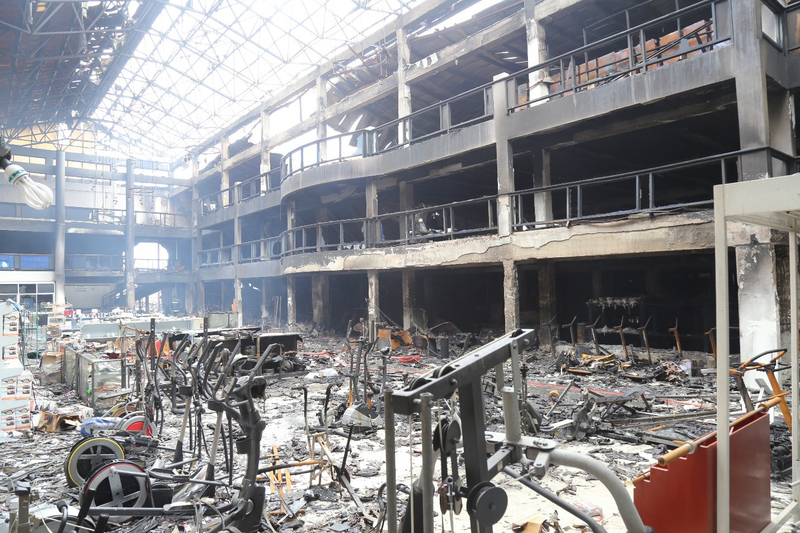 Because of the rush to evacuate the building, the women stated that they were forced to leave their bags behind and they were subsequently destroyed by the fire. Singh told Stabroek News that she barely managed to slip her feet into a pair of slippers before running out of the building. She noted that she was one of the many who lost personal items in the fire. Speaking on the effects of the fire on her employment status, Singh noted that the option of being redeployed is better than being unemployed because there would still be hope for the countless workers who have been displaced as a result of the fire. “Mr. Gafoor is like a father to us and he just sat there yesterday (Monday). We are distressed because this is our livelihood, this is what we depend on, our families depend on this, [and] our children depend on this. I am a single parent and I depend on this. But we are here today to be with our boss and give him the support; we know that he is trying his best because he has us here and is giving us hope,” she said. Henry shared similar sentiments as she offered praise to her boss for his dedication to his employees. “I’m here today because I know we have a very faithful boss who will take care of us, and we are all going to help him start a new beginning again. All in all, I feel that we would be able to stand on our feet again in the coming weeks, because this is only the second day and we are actually on the road already,” Henry related. 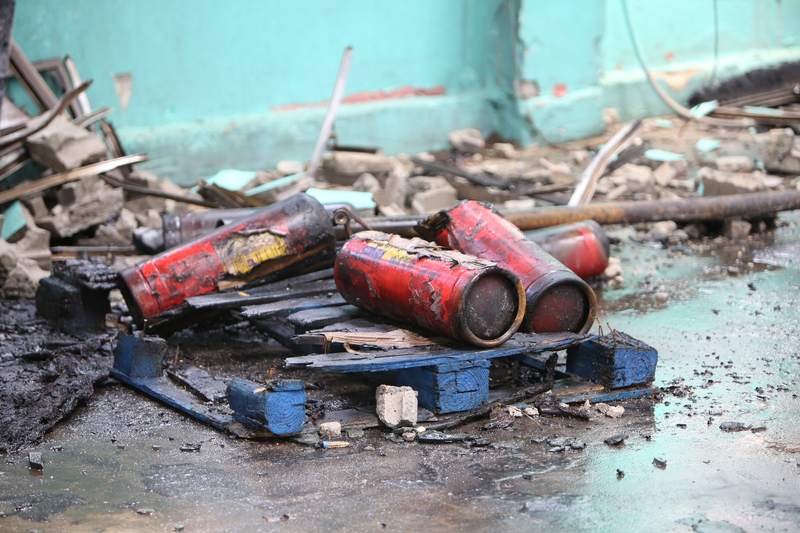 Burnt fire extinguishers were seen yesterday when Stabroek News visited the Houston Complex. Representatives from Hand-in-Hand Mutual Life Insurance company as they examined the sections of the building that were affected by Monday’s fire. Small “pockets of fire” as seen in this picture were said to be still burning up to midday yesterday. A view of what is now left of the Gafoors’ Houston Complex in wake of Monday’s massive fire. Scores of employees were in the only section of the Complex that was not affected by Monday’s fire. 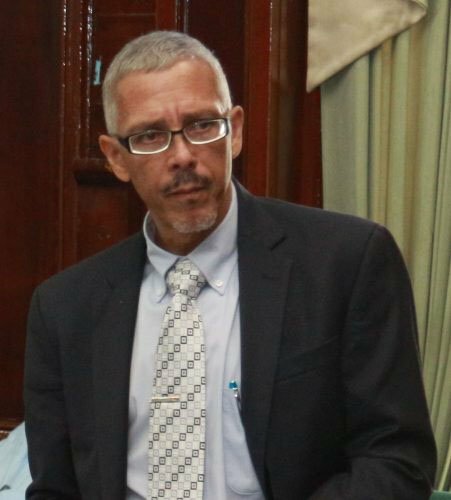 Also present at the scene yesterday was Guyana Fire Service Operations Manager Compton Sparman, who said the cause of the fire has not yet been determined. He, however, said that he does not suspect arson. 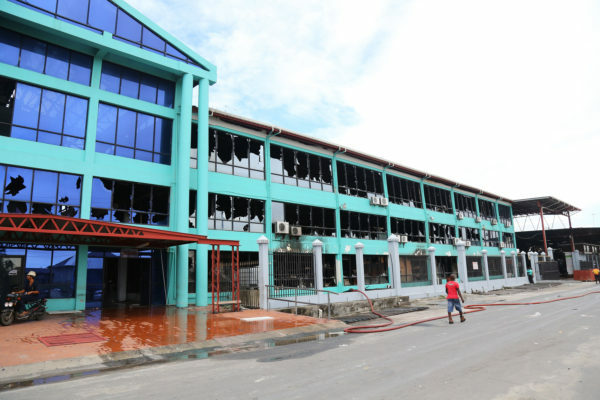 Nevertheless, investigations are on-going while attention was being placed on extinguishing the pockets of fire that were still burning so that the building could be handed over to the owner. Sparman noted that because of the building’s size, design and combustibility, access to the area was not easily achieved. He explained that because large amounts of debris had accumulated during the blaze, it was hard for the water to penetrate the bottom, thus firefighters were left to mop up debris to allow them to completely extinguish pockets of fires that were still burning. However, he assured that the fire was at that time completely under control, while adding that they managed to save 40% of the entire complex. He went on to explain that a total of six bonds were destroyed while the remaining 8 were saved from the fire. Sparman also stated that the design of the building was so done to better suit an administrative setting than a bond, thus Monday’s fire proved to be a very complex situation. “These type of structures need proper early warning systems. There is only so much the Fire Service can do because whatever we come and reach, we either let it stay or it could escalate and we could try to confine it…,” he noted. Because of this, Sparman noted that it is constantly advocated that buildings of such designs should be well equipped with the necessary fire suppression systems to prevent fires from becoming uncontrollable. “it is advisable to implement the basic requirements, not just fire extinguishers but also fire suppression systems, like the water sprinklers or ring mains, so that in the event that a fire should occur, the sprinkler system could start firefighting automatically before the fire service arrives,” Sparman related. Additionally, he noted that personnel could also be trained to help confine the fire until the fire service arrives. Sparman related that six firefighters had to be taken to the hospital after some were injured as a wall collapsed on Monday evening while others were treated for smoke inhalation. The men were sent on leave and are recovering well. He noted that the lack of available breathing apparatus may have resulted in the smoke inhalation. “There were no breathing apparatus available for the service men or women, which is important because of the type of material and the toxic fumes that can be inhaled,” he said.